A recipe for spicy ghost pepper salsa made with garden grown ghost peppers, tomato, onion, lime juice and cilantro, all simmered together to let the flavors meld, picante style. More ghost pepper salsa! Am I crazy? No way! Ghost peppers are nice and spicy, and they have an addictive fruity flavor, especially when they’re cooked into a salsa. I’ve been cooking a LOT with ghost peppers lately because my ghost pepper plants are REALLY productive this year. Good for me! I get to add more to my ghost pepper recipes to really spice things up. If you want to cook with ghost peppers, you need to be ready for the heat. Ghost peppers, aka Bhut Jolokias, top out at over 1 Million Scoville Heat Units, which is roughly 200+ times hotter than an average jalapeno pepper. Learn more about ghost peppers here. Yes, that is some very nice heat there, but as mentioned, with that heat comes some excellent flavor. And that extends to this salsa. Oh yeah! Ready to dig in? I am! The color is so vibrant. It just wants you to dip a chip right in there. But beware. 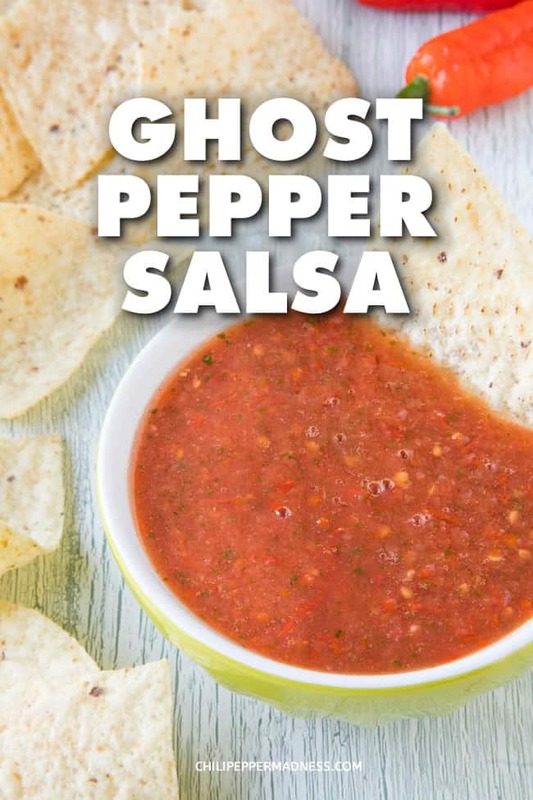 You’ll notice some heat right off the bat, but ghost pepper salsa is more of a blooming heat, so after a few more bites, you’ll notice the warmth building in your mouth. If you’re not used to ghost pepper heat, get ready for a little sweat. All of my ghost pepper loving friends will LOVE this salsa for sure. So let’s talk about how we make this ghost pepper salsa, shall we? It’s super easy, as we’re working with fresh ingredients. 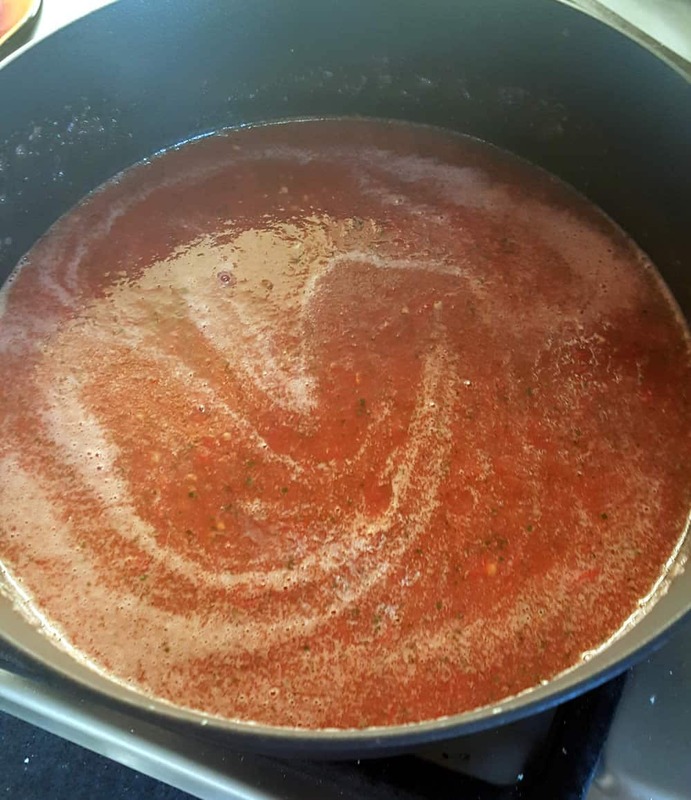 NOTE: This recipe is extremely similar to my Fresh Ghost Pepper Salsa Recipe, but we’re extending the recipe steps to include processing and simmering to make more of a picante style sauce. First, gather up your ingredients – 4 ghost peppers, a medium sized tomato, a small white onion, a large lime (or use 3 tablespoons lime juice), 1/4 cup chopped cilantro, and a bit of salt. 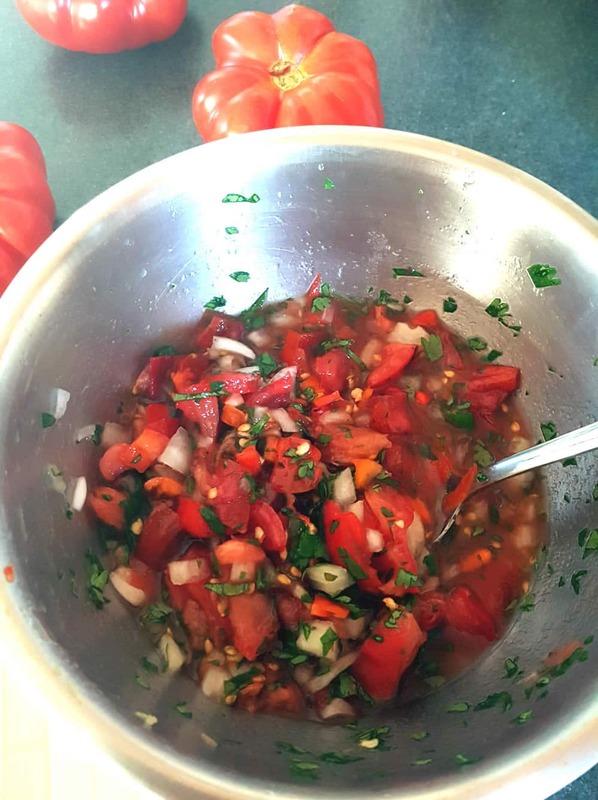 Chop the peppers, tomato and onion, then add them to a bowl with the lime juice and cilantro. Toss everything together to combine it. Add in a few sprinkles of salt to your personal tastes! Right here is my Fresh Ghost Pepper Salsa Recipe. You can serve this up as it is, or! Continue on for the picante style sauce. Next, Add all of the ingredients to a food processor or blender and process it until it is nice and smooth. Add the ingredients to a pan and bring to a quick boil. Simmer it for about 15 minutes to let the flavors develop. Cool, and adjust with salt to your tastes and BOOM! It’s that easy. Truly. Don’t you just love easy food? Salsas are easy. I like to cover it and let it chill in the refrigerator at this point to let the flavors develop even further, but honestly, you can eat it once it’s cooled if you’d like. You can easily adjust the ingredients to your preferences. If you’re concerned about the heat, consider using only 1 ghost pepper and filling in the recipe with other peppers. You can even use bell peppers for this. Or, if you’re looking for extra heat, this recipe can easily use up to 10 ghost peppers or more. Make it REALLY hot if you want! Sure! A word to the wise. As mentioned, ghost peppers are VERY HOT, so it is best to wear gloves when handling them. The oils can get onto your skin and can cause burning. Avoid touching your eyes or other parts of your skin to avoid that burn. If you do feel the burn on your skin, consult this page – How to Stop the Chili Pepper Burn. Salsas are always popular on game day gatherings, or pretty much any party situation. Try some of my Game Day Recipes for more ideas. I also like to use salsa as a topper for any grilled or roasted meats, like chicken, pork, and especially fish. White fish LOVES a good salsa, and it makes for a healthy meal. Combine all ingredients in a mixing bowl. Mix well. Taste and adjust for salt. Add the ingredients to a food processor or blender. Process until nice and smooth. Pour the salsa into a pan and bring to a quick boil. Reduce heat and simmer at least 15 minutes to let the flavors develop. Cool. You can serve right away or cover and refrigerate overnight for the flavors to mingle and develop even more. Serve! Heat Factor: HOT! 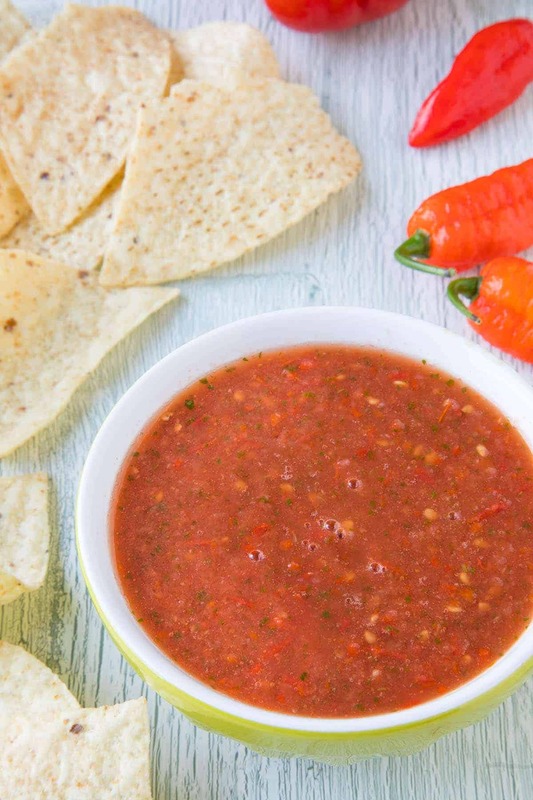 You'll get a good level of heat with this ghost pepper salsa recipe. Ghost peppers are the original superhot chili pepper. But it's worth it! Is this recipe safe for canning and storing long term? Ainsley, you can pressure can this or freeze it. If you want to water bath it, check the ph first to make sure it is 4.0 or below, ideally 3.5 or below for long term storage outside of the refrigerator.